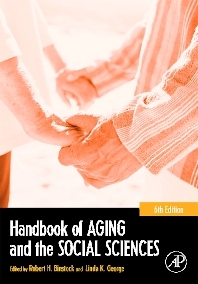 The Handbook of Aging and the Social Sciences, Sixth Edition provides a comprehensive summary and evaluation of recent research on the social aspects of aging. The 25 chapters are divided into four sections discussing Aging and Time, Aging and Social Structure, Social Factors and Social Institutions, and Aging and Society. Within this context, aging is examined from the perspectives of many disciplines and professions including anthropology, bioethics, demography, economics, epidemiology, law, political science, psychology, and sociology. The Sixth Edition of the Handbook is virtually 100% new material. Seventeen chapters are on subjects not carried in the previous edition. Seven topics were carried over from the previous edition but written by new authors with fresh perspectives and brought up to date. Some of the exciting new topics include social relationships in late life, technological change and aging, religion and aging, lifestyle and aging, perceived quality of life, economic security in retirement, and aging and the law. There is also a greater emphasis on international perspectives, particularly in chapters on aging and politics, diversity and aging, and immigration. The Handbook will be of use to researchers and professional practitioners working with the aged. It is also suitable for use as a course text for graduate and advanced undergraduate courses on aging and the social sciences. Researchers in gerontology, developmental psychology, social psychology. and sociology. Psych of aging courses CMG SS7340 562 total faculty. Past buyers of 5th edition Handbook of Aging and the Social Sciences. 1 Aging and the Life Course Richard A. Settersten, Jr.
19 Aging and Politics: An International Perspective Alan Walker, Ph.D.
22 Emerging Issues in Long-Term Care Robyn I. Stone, Ph.D.
Robert H. Binstock has been Professor of Aging, Health, and Society at Case Western Reserve University since 1985, following two decades at Brandeis University. A former President of the Gerontological society of America (1975-1976), he has served as director of a White House Task Force on Older Americans (1967-1968) and as chairman and member of a number of advisory panels to the United States government, state and local governments, and foundations. He is presently Chairman of the Gerontological Health Section of the American Public Health Association. Professor Binstock is the author of more than 150 articles on the politics and policies affecting aging, and his 19 books include the three previous editions of the Handbook of Aging and the Social Sciences, The Future of Long-Term Care: Social and Policy Issues (1996, and Dementia and Aging: Ethics, Values, and Policy Choices (1992). Among the honors he has received for contributions to geronotology and the well-being of older persons are the Kent and the Brookdale Awards from the Gerontological Society of America, the Key Award from the American Public Health Association, the American Society on Aging Award, and the Arthur S. Flemming Award from the national Association of State Units on Aging. School of Medicine, Case Western Reserve University, Cleveland, Ohio, U.S.A.
Linda K. George is Professor of Sociology at Duke University, where she also serves as Associate Director of the Duke University Center for the Study of Aging and Human Development. She is a former President of the Gerontological Society of America (1993-1994) and a member of the Executive Committee of the Aging Section of the American Sociological Society. She is former editor of the Journal of Gerontology, Social Sciences Section and is currently on the Editorial Boards of the American Sociological Review and the Journal of Aging and Health. Professor George is the author of more than 150 journal articles and book chapters. Her six books include Quality of Life Among Older Adults (1980) (co-authored by Lucille Bearon), which has been in print continuously for 15 years. She co-edited the Third Edition of the Handbook of Aging and the Social Sciences. Her major research interests include social factors and illness, stress and coping, and subjective well-being, all of which she examines primarily in the context of later life. Among the honors Professor George has received are Phi Betta Kappa, the Duke University Trinity College Distinguished Teaching Award, and the W. Fred Cottrell Award for Outstanding Achievement in the Field of Aging. Professor George received her B.A. and M.A. degrees in Sociology from Miami University, Oxford, Ohio. She received her Ph.D. in Sociology from Duke University and also completed a postdoctoral research fellowship in aging there. James H. Schulz is Professor of Economics in the Florence Heller Graduate School at Brandeis University, holds the Meyer and Ida Kirstein Chair in Aging Policy, and is currently Director of the Ph.D. Program. He is on the Board of Directors of four mutual funds sponsored by the American Association of Retired Persons and managed by the investment firm of Scudder, Stevens, and Clark, and is a consultant to the International Social Security Association, the United Nations, and the World Bank. Professor Schulz is a leading authority on pensions, retirement policy, and the economics of aging-authoring over 100 books, reports, and articles. His major books include Providing Adequate Retirement Income, Economics of Population Aging: The "Greying" of Australia, Japan and the United States, and The Economics of Aging, (just published in its sixth edition). He is a fellow and past president of the Gerontological Society of America and a founding fellow of the National Academy of Social Insurance. Among his awards is the 1983 Robert W. Kleemeier Award for outstanding research in aging. The Policy Center on Aging, Brandeis University, Waltham, Massachusetts, U.S.A.